I’ll be honest, I have never liked flexi/retractable/zip leashes. They’ve never made much sense to me. I see an owner hanging on to a handle, disengaged, and a dog doing whatever they want, usually at 20+ feet away. They are relationship killers. Over the years dog owners have tried to tell me how great they are, and I’ve listened, maybe I was missing the point? I can be open like this. But every time I see an owner use one, and see the total disconnect and lack of relationship, there is nothing that can convince me to say a nice thing about them. Not even to take a dog out to eliminate. They sabotage loose leash walking, they kill the relationship when out and about with distractions, they encourage independent behavior, and they can be dangerous when a dog wraps around a handler or lunges. There is simply no reason, zilch, that a dog should be 20+ feet away from a handler when walking down town, in a store, on a busy sidewalk, or in a neighborhood. Guess what happens when something hits the fan? Instead of calling the dog back, or simply being right next to them, you can reel your dog in, or better yet yank them back to you. There is no good teaching or training going on there, and it simply falls into the I have no relationship with my dog when out and about category. We have a man who walks his border collie on what I think is a four to five mile loop every morning like clock work. I have seen him easily for three years, doing the same thing, during all weather conditions. His dog has been on a flexi leash the whole time, straining at the end of it for the past three years. They walk but there is no relationship and for sure no connection. The same the same the same every morning. Well apparently he had it this morning. As I passed by, he was jerking and lifting this dog off the ground and yelling HEEL from a good 20+ feet away. The look of confusion and fear on this dogs face was so gut wrenchingly sad. 365 days a year for a few years, the same walk, and now this? This man never prepared the dog for a heel or even a simple loose leash walk. And then this morning he decides, today is the day you will heel. I have a few other choice words for this man but I’ll spare you all. Use your voice as your first leash, spend time teaching your dog, learn to work as a team, and build a trusting relationship. It all takes time, but honestly, you cannot expect behaviors if you have not put the time in. And by putting time in, it is a life time, just like for us. Always learning, always changing. When I used to do massage at the Ritz Carlton, I had a client whom I had asked my standard question….”Do you have any health issues that I need to know about?” She said, yes, I have a prosthetic tip to my finger. It was all because she had her finger wrapped in one of these leashes and her dog lunged at another dog. POP The finger popped off, nowhere to be found and her dog was in a fight. GROSS!!! Hi Nancy, I’m enjoying your blog! I wanted to chime in here because I’ve heard so many negative comments and yours is the most common complaint. I don’t think that I am disengaged with my dogs when I walk them on the retractable leashes, but I guess I could be wrong. The thing is that I have two small dogs who love-love-love to zoom around and they absolutely HATE the dog park. My yard is not large enough for them to zoom and there is nowhere that’s safe (or legal) for them to be off-leash except the dog park. So I let them zoom on the retractable leash. Now, mind you, they’re only zooming when we have the sidewalk to ourselves! We rarely see anyone on our walks, but when we do, I shorten and lock the retractable at about 3 ft. Yes, I’ve been burned by the leash and yes, they’ve popped it right out of my hands on many occasions. I don’t actually LOVE retractable leashes for these reasons, but I’m torn because my little cocker spaniel is so happy when she’s zooming and I don’t want to deny her that experience. What advice do you have for this situation? A regular long-line leash seems even more hazardous than a retractable leash to me. What do you think? Are there other options I haven’t considered? Hi Sherron, nice to hear from you. So this is where it becomes tricky. We want our dogs to have fun and be happy, but also under control when out and about. I generally have behaviors I want for certain jobs or tasks, behaviors from me and my dogs, it’s not just about my dogs. When I am out and about walking my dogs we are walking and sniffing, but it is easy and hopefully stress free. I don’t use our walks for play. When we are in the yard we are working or playing, when we are hiking it is mellow and we are hiking, there isn’t too much play, sometimes if they are really into a fetch game or something we do, but it isn’t often. I’m not a super huge fan of dog parks, and with little ones you have to be a bit more selective with the parks you use. I think if I had two small ones I would walk to a fenced in ball park, and once we were there I would give them the OK to run. If you have enough space you can buy really inexpensive garden fencing and make a temporary fenced in area for them to run, many of our condo clients do that and it creates a successful safe area to run. SO I guess what I am saying is, you have to decide what the definition of sidewalk walking is for you and your dogs, what play is for you and your dogs. I for one don’t want my dogs zooming or playing when on a leash, for the injuries I have seena nd then ones you and others have mentioned. I’m glad to hear someone that agree’s with me on the retractable leashes. When they first came out my neighbor, who had a sassy Pappillon, thought they were just the best. But she wondered why her dog kept getting attacked on walks!!! Either he was charging up to unknown dogs with his pit bull attitude (yup that can getcha in trouble) or if a dog came out toward him, he was 20 feet away and the owner couldn’t do anything about it!!! I had a lab owner once who thought they were great until he took off the other direction with the cord reeling, pulling the handle part right out of their hand. Since I work with seniors a lot, I had one that said it’s so easy to hold on to. I said fine, just don’t let it go reeling out and teach the dog to walk beside you. And who would think that holding this thing in your hand, which to me is heavy, instead of simply holding the loop of the leash, is easier, I don’t get it??? It scares me to death when people are walking their dogs on retractables in the road/street when I drive by. . . .I’m afraid the dog will dart in front of me. For the lab owner, who thought their dog needed to run even though they walked slow, I found a teenager that would jog with the dog . He got the exercise and then the owner could take a lazy stroll later. It was a win win – – – the dog got exercise, the kid made a few bucks plus got to spend time with a dog (his parents wouldn’t have dogs) and if the owner was too tired for a walk later, it didn’t matter, if they took a walk, the dog was tired and ready for a leasure stroll. I guess if the owner using a retractable still taught the dog to come back at the blink of an eye, they might work, but I’ve never seen someone use one that has any control of the dog. I dislike retractable leashes for every reason you mentioned…except that I find it most necessary for just one use…hiking. I attach mine with a large carabiner to my backpack hip belt when we hike. It’s only 16-ft long…just enough to allow her to stay in front of me on trail without tripping me. Hiking is NOT a mellow affair with Holly…she is a VERY busy girl no matter how long the hike and I can’t tell you how many times she’s hurt herself and then spent months recovering for some flying leap into wild blue yonder because she got the goofies (she’s currently laid up for an iliopsoas strain she did on a hike back in May!). It isn’t about recall…her recall is excellent even while hiking in the backcountry…she just doesn’t have much sense of self-preservation. So, a leash is necessary for her safety, wildlife safety, and for mine. A long line snags on everything, and I hate managing it, and a 6-ft leash is too short for our single file trails. I still bring a 6-ft leash that stays within reach at all times so I can switch leashes quickly if needed. But in towns, near other people, and for regular walks with your dog? Retractable leashes spell nothing but trouble! Great post. I must say that I agree with 99.9% of what you stated regarding retractable leashes. I have to also say that I was an outspoken advocate against them for many years until 12 months ago. Now, I see them like many other tools and in the wrong hands they are truly dangerous for owners, dogs and other owners/dogs that have to come into unwanted contact with them. However, I now see that dogs owners that are clueless and/or have no doggy etiquette are the real problem, not necessarily the leashes (though they can be a safety hazard-burns, lost fingers, etc if you are not careful). So, what changed for me. We relocated to another city and spent two months in a 1-br apartment with our three dogs; an APBT, a staffordshire bull terrier, and our amstaff/mastiff mix. I was also four months pregnant. I am extremely responsible with my dogs since pitties are often unnecessarily targeted, so they are NEVER off-leash. I also don’t frequent dog parks which means they are never free to just be dogs. They are extremely well trained and walk beautifully on flat collars. In the past, I would carry a long line on walks and then allow each dog to have some fun. With my growing belly and hilarious waddle, I had enough to carry with water, keys, etc, so one day I tried a flexi-leash and was amazed at how convenient is was. Admittedly, being a responsible and educated dog owner (I am also a professional trainer), I would lock it when walking along neighborhood streets and my dogs would continue to walk their normal heel. But when we were in parks where my dog could have access to a little freedom, I found them quite liberating. I spent these times building my relationship with my dogs, working on recall and just having some fun. 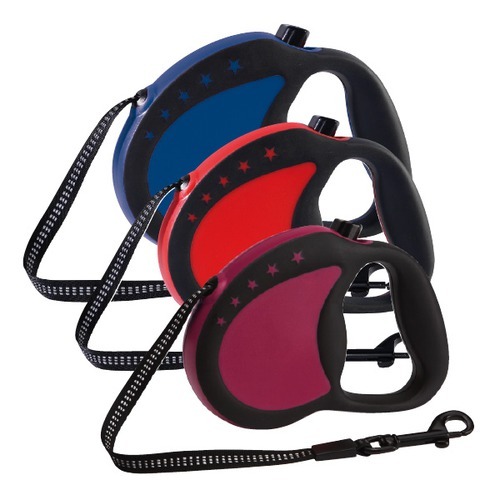 These days, the retractable is always in a pocket in my stroller and I will use it on some of our walks when I find a nice park and my dog can have some extra freedom.